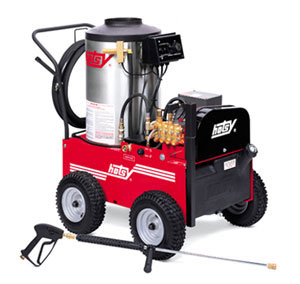 Hotsy Cleaning Systems, Inc. carries many hot water pressure washer models in a variety of formats. Why choose a hot water pressure washer? Because cleaning with hot water is often quicker and in some cases, more thorough, depending on what you’re cleaning. For instance, if you’re cleaning oily-based residues, a hot water power washer will cut through and penetrate grime at the molecular level, instead just pushing it around like a cold water machine does. For industries like food processing that worry with sanitation requirements, a hot water power washer provides a defense against germs and bacteria. By the time the water rushes out of the heating coil and through the wand, it will have reached temperatures of up to 200°F. Combine this hot water with our specially formulated detergents, and you have an outstanding cleaning weapon, delivering a one-two punch. 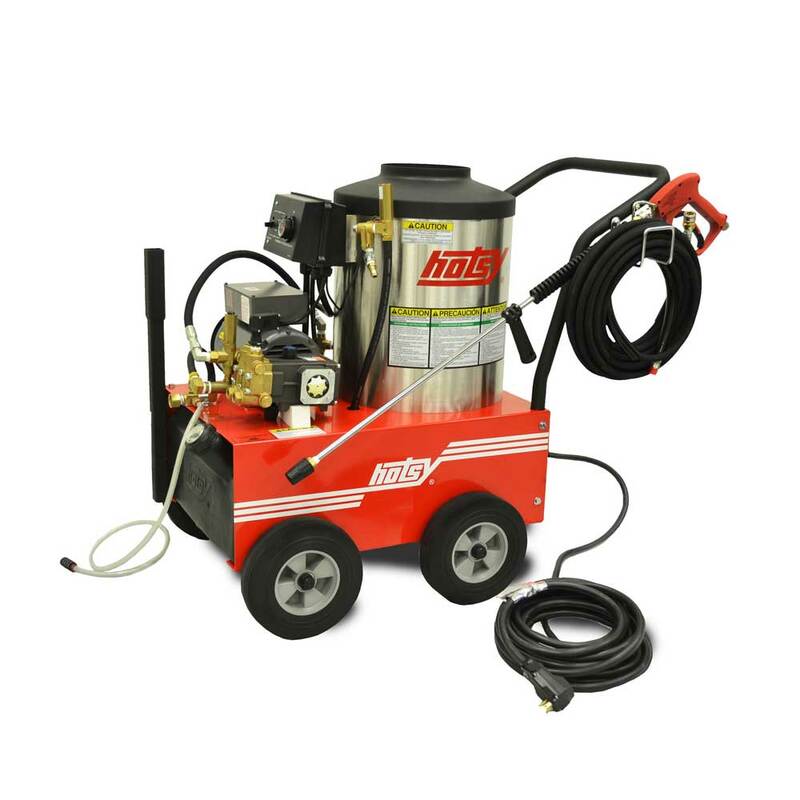 Hotsy hot water pressure washers use either electric or gasoline to run the high-pressure pump and a secondary fuel source to fire the burner. The choice between electric or gasoline-powered hot water pressure washers is typically dependent on where you’ll be cleaning. 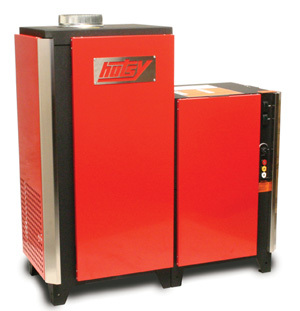 Next pick a fuel source for the burner - Hotsy hot water washers are heated with fuel oil, diesel, natural gas, propane, or electric. The final choice depends on whether or not you need portability. We have locations in Madison, La Crosse, Eau Claire, Wausau, Green Bay as well as our main location in Delafield. Call toll-free (800) 242-2353. Our most popular series features an electric motor. Most models are Oil-Fired, but one is LP-Fired, with a 1725 RPM Direct-Drive Pump. These are ideal for industries such as construction, manufacturing, trucking, agriculture and more. The 500 Series are compact, sporty and easy to operate. Electric motor, Oil-Fired, LP-Fired or Natural Gas Fired, available in Direct or Belt Drive models. Provides industrial cleaning power with small business affordability. Multiple fuel and electrical options. 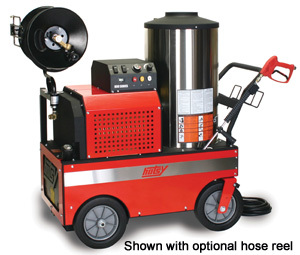 (shown with optional hose reel) The 800 Series is a mobile oil-fired washer with electric motor and belt drive pump. Designed with 12” rubber tires and beefy casters for easy maneuverability. Uses the reliable Hotsy Crossfire burner. The 900 Series is a stationary hot water washer packed with standard features like programmable smart control, which includes auto start/stop and time delay shutdown capability. The electric powered washer is heated with natural gas or liquid propane, and features a belt drive pump with tensioning system. 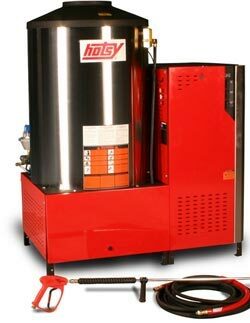 The 1400 Series is Hotsy’s flagship stationary hot water washer that has been redesigned with many standard features, with safety and innovation in mind. Not only does the programmable smart control allow you to set auto start/stop and time delay shutdown functions, but the thermostat and shutdown settings are concealed, so you can set it to meet your individual needs. 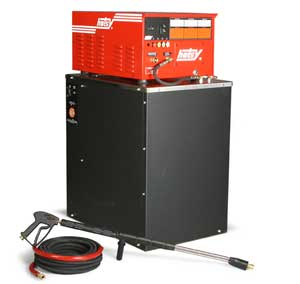 The electric powered washer is heated with natural gas or liquid propane with cleaning power up to 5.0 GPM @ 3000 PSI. Designed for tough, industrial cleaning jobs, the 1800 series is Electric Powered, Natural Gas Fired (optional LP-Fired). Perfect for indoors and highly efficient. All models equipped with stainless steel coil skin on the combustion chamber. Electronic ignition for easy start/stop. Time delay shutdown and thermal shutdown are standard. Perfect for manufacturing or food processing facilities. Electric Motor, Oil or Natural-Gas-Fired, and Belt Drive Pump. Big volume, high pressure and rugged construction make this washer perfect for your toughest cleaning applications. Indoor or outdoor cleaning. Gasoline powered engine with Oil-Fired burner, designed for hours of rigorous cleaning performance! 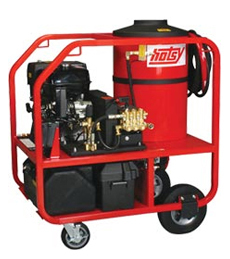 Ideal for truck or trailer mounting, these engine-driven models are totally self-contained, field-portable and ready for your toughest cleaning tasks. 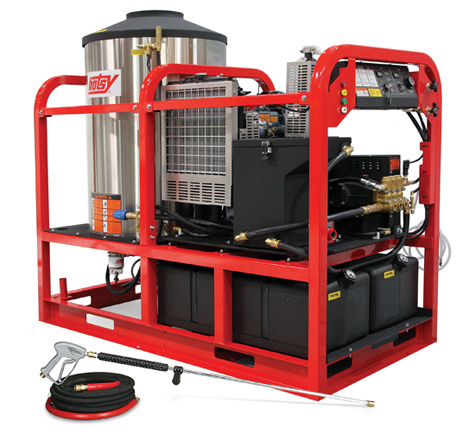 These powerful units are perfect for construction, agriculture, trucking or any industry that requires top cleaning performance and durability from their pressure washer. Portability, roll-cage, and skid package are optional. As the name implies, this gas powered series is big on power and versatility. All models are Oil-Fired with a 12V DC burner. We offer direct drive models and Belt-Drive models. 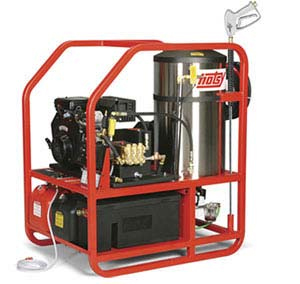 Our belt-drive Gas Engine Series offer versatility - converts to a skid unit, portable or truck mount. The only All-Electric hot water washer we offer – quiet, ideal for indoor cleaning because it does not emit fumes. Belt drive pump with auto start/stop feature. Ideal for manufacturing and food processing cleaning. 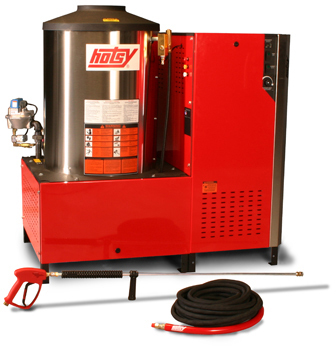 Powered by a diesel engine, these are the biggest and most robust washers Hotsy offers. There is literally nothing else as big and powerful as the Super-Duty HSS models.